The first thing you need to know about wheelchair rugby is that it is almost, but not quite, entirely unlike rugby. I’ve always loved the sport as it was originally named, “murderball.” With its violent crashes, Mad Max-esque tank-chairs, it has far more in common with murder than with rugby anyway. Murderball is a sport whose name pitches itself. I don’t have to tell you why you want to watch murderball; you already know you do and and you want to know more about it. Follow along, friends, and I will tell you about a sport that is not some watered-down “aww isn’t it nice those disabled people have a sport,” it is straight-up one of the most savage and fun spectator sports around, so enjoyable should have pride-of-place on ESPN on the regular. Wheelchair rugby was invented by and for athletes with quadriplegia (now expanded to a broader range of players with impairment in three or four limbs), many of whom felt that the hand function required to dribble and shoot in wheelchair basketball made them uncompetitive and frustrated by the sport. So they invented their own. 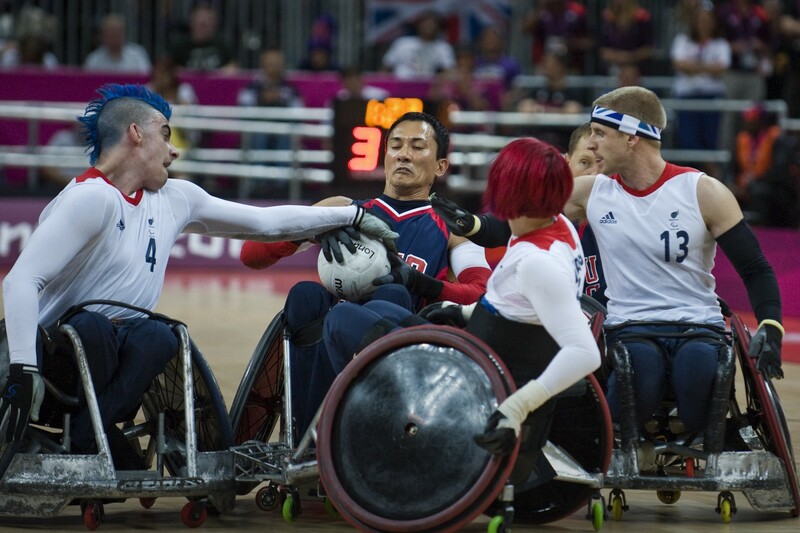 Wheelchair rugby, then, has much less dribbling and ball-handling by nature, and it is focused on more positional tactics. These are the guys with the vicious pick cages on the front of their chairs. Often players with more impairment, they’re rarely the fastest on court, but they’re the troublemakers gumming up the works: defending blockers will use their picks to try to latch onto the chairs of the offensive players and hold them back so they can’t move or score, or they’ll simply get in the way as the offenders move up court so the offender has to dodge. Every dodge and turn the defending blocker forces the ball-handler to do eats up speed and time, giving the rest of the defending team the opportunity to catch up and stop the ball-handler. Offending blockers also screen for the person handling the ball: the ball-handler will tuck behind her blocker, letting the defending team tangle with the blocker instead of the ball-handler. With the blocker taking the defender out of the equation, the ball-handler is free to make her way up court unhindered. This video shows how important blocking and screening are; the second play also shows two defenders straight-up locking down a New Zealand ball-handler, which leaves Australia with fewer players available on court, but totally deprives New Zealand of a key offensive player. This video also ends each clip with a nice hit, because I get you, reader, and I am gonna give you what you want. The speedsters of the court, you’ll see these folks scoring most of the goals. Whereas the blockers have pick cages to try to latch onto other players, the ball-handlers’ chairs are smooth and shielded, trying to give the blockers as little to lock their cages onto as possible. Many of these players have more core strength, which allows them to really lean in as they push and pick up speed, and more arm and hand function, so they can dribble, pass, and catch the ball more easily. On offense, their speed and agility makes them the ones you expect to get the ball and score the goal (though a smart offensive side will toy with those expectations, passing the ball to blockers to force the defenders to peel off the ball-handler and go after him, then pass back to a now-open ball-handler). On defense, the ball-handler may not have a pick cage to lock down the offensive players, but the ball-handler can build up the speed to lay in a big hit to stop the offender cold in her tracks. Yeah, let’s talk some more about the hits. Let’s face it, we’re all here for the hits. There is no contact sport with a more satisfying SMASH! than wheelchair rugby. It is not the muted thud of American football players whose helmets and pads meet. It is not the rattle of a hockey player meeting plexiglass. When metal meets metal in a good rugby hit, the crash reverberates like thunder, filling the room. Some kinds of hits aren’t legal; most hits are because it’s the best thing about the sport and the reason most of us got into the game in the first place. These chairs are built to take a hit, and none of them stay shiny and new for long. A hit might tip you over, and that’s legal and fine. Tip happens. Play stops, and the player gets picked up because those chairs are heavy as hell and most of us can’t get back up on our own in those like a lightweight little basketball chair. The chair takes the brunt of a hit, and injuries are rare as contact sports go, with none of the concussion risk of repeatedly smashing your head. Wheelchair rugby offers both players and spectators the delicious, primal joy of deafening crashes and violence that’s particularly gratifying to disabled players who are too often patronizingly treated as fragile. Wheelchair rugby has all of the things you love in a sport: it’s fast-paced, tactical, and visually compelling. Though these days it’s named after rugby (I’ll never stop calling it murderball), it’s a sport all its own, not an imitation or adaptation. It’s built around the creative constraints of a high-contact sport for wheelchair users, with its own rules that fit the physics of the chairs and the physicality of the players. This week the Paralympics feature 8 teams who emerged from a hard-scrabble battle to qualify for this knock-down, drag-out war for the gold medal; these are the best-of-the-best and every game is going to be intense as hell. The schedule is available here (all times are Rio local), with prelims throughout the week and a Saturday of semi-finals before the ultimate medal matches on Sunday. Americans can watch livestream footage here, and international audiences can find streams and streaming information here. Enjoy!